Wind energy together with clean hydrogen can play a vital role in decarbonising economies, WindEurope CEO Giles Dickson will tell delegates at the Gas Infrastructure Europe conference today in Prague. Wind power is now 154 GW capacity and accounts for 10.4% of power demand in the EU. And it now supports the wider energy system and economy. Cost reductions and new technology are helping to reduce consumers’ energy bills. Direct Power Purchase Agreements are allowing industrials to hedge against the volatility of energy costs. And by providing grid support services, wind is contributing to the secure management of the power system. 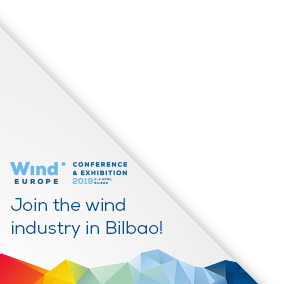 Giles Dickson, WindEurope CEO said: “Wind energy has enjoyed three decades of growth and is now Europe’s second largest form of power generation. As capacity continues to expand, wind will play a vital role in decarbonising Europe’s economy. It is a key partner in the energy transition. For example it’s one of the main sources of clean hydrogen so will be key in driving up the supply of hydrogen for industrial applications and energy storage. Europe’s gas transmission infrastructure will play an important role in transporting these increased volumes of clean hydrogen. Wind can also help reduce the costs of offshore oil and gas through shared infrastructure and in the future via ‘power to platform’ technology. The message to the gas infrastructure industry came as WindEurope, in partnership with Eurelectric, the European Copper Institute, Solar Power Europe, Avere and the Europe Climate Foundation launched ‘The Electrification Alliance’. The partnership highlights the idea that the decarbonisation of transport, heating and cooling and its integration into the electricity system needs to be a cornerstone of the energy transition. Powering these sectors with clean electricity is essential for sustainable economic growth.